the kershaw junkyard dog 2 composite blade is an excellent knife for EDC, i bought mine a good 7 months ago and it has been solid since then. the ergos are exceptional, it feels like an extension of my hand when i hold it. the composite blade is both good looking and very economical. it brings the end line user a high quality cutting edge steel at a lower cost. the G10 on the handles is very grippy and feels nice in the hand. the lockup is very tight and assuring. opening is very easy due to the flipper mechanism. my only complaint with the design of the knife is the pocket clip, it is too wild for my tastes. but it does a great job of holding the knife to your pocket. 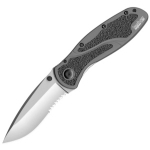 overall i highly recommend the kershaw JYD composite blade, it is a great knife for the money and cool looking to boot. WOW what a steel!!! Purchased from kershawguy on bladeforums. Tim Galyean is making some killer designs. D2 composite blade is a thing of beauty. It came scary sharp from factory. Grey G10 is very nice looking and grippy. This is the smoothest opening knife I have ever felt. I have no problem getting it to open fully every time with just a minor flick of the flipper. Ergos are perfect as it conforms to my hand perfect. Wish the clip could be moved to tip up carry. A little large for edc but not excessively. Now they need to make the JYD1 with G10 and composite blade = HOMERUN for EDC. I love this knife. It lives up to its name, which is good and bad, depending on your point of view. This is a big, serious looking knife. I would be reluctant to carry it in an office environment or among the knife-leery. It is not huge, but bigger for a folder, and heavy. The pocket clip is very nice looking but not discrete. If your aim is to deter bad guys in a questionable neighborhood, this would be a good choice. It would also be a good, heavy-duty user. The blade steel is amazing for a knife in this price range, and the cost is quite remarkable given the quality of the piece. The blade is also unique looking and high on the cool factor. It feels solid in your hand. The handle material is tough (G-10). The flipper mechanism is not spring assisted, and is fun to open with a flicking motion, but it takes a bit of practice to do it well. The best feature about this knife is that you get many of the features of more expensive knives at a fraction of the price. The downside is that it can look menacing to some, and it rather heavy. I love this folder! it has great ergonomics and is built like a tank. 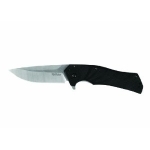 If your looking for a less expensive alternative to the zt line from kershaw, this knife could be a good buy. 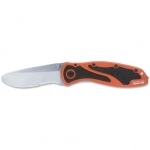 Its really built to be a cut above many other knives in its price range. I really like the flipper action. The knife came to me from the factory with such a smooth pivot action it was great! I also really like the composite blade with the d2 tool steel. It really provides a nice cutting edge without being as prone to corrosion as a fully d2 blade. It's slightly large to be used for anything like edc but if you need a good general use outdoor knife or a companion to a larger fixed blade this knife wont let you down.